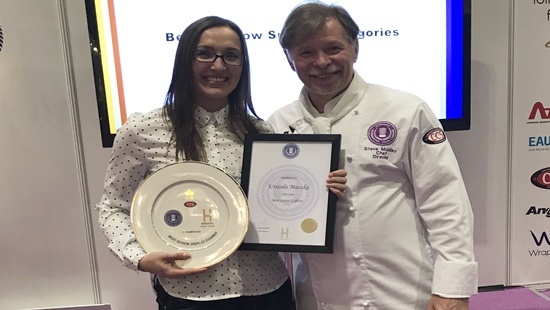 Join us as we speak to Urszula Maczka from Designed Cakes and discover more about her award-winning creations from this year’s International Salon Culinaire 2018! Urszula loves to model and make 3D cakes and is hoping that from next year cake decorating will be her sole career. We asked her to share with us her recent experience of competing at this year’s International Salon Cullinaire. Is this your first time entering? 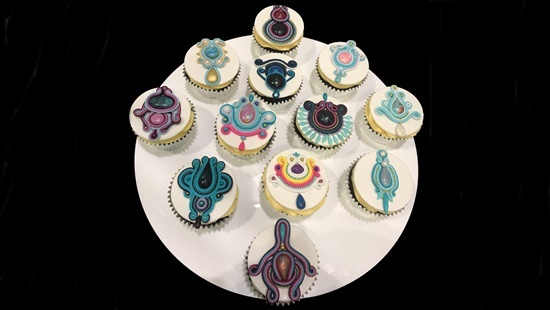 Bronze award for ‘Soutache’ style decorated cupcakes. 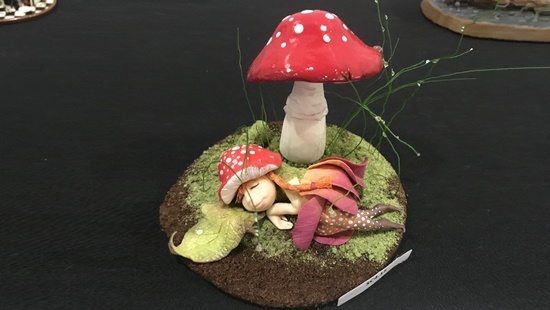 Gold award, for my ‘Little Fairy’ in the miniature exhibit category. Gold award in small decorative exhibit for ‘Mr. Rabbit’. 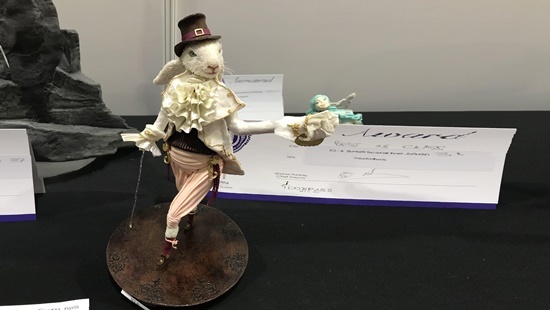 My Rabbit figure has also won Best in Class award, Chairman of Judges Award – Sugarcraft and Best Senior Exhibit. I couldn’t be happier as all three of my exhibits received good response from the judges. What made you want to enter? I’ve entered the show because I like new challenges. Getting ready for each show, I try to use different techniques and learn something new from it. Of course, judges feedback is very helpful and important. Constructive criticism is one of the most important factors in my self-tuition. Thanks to professional opinion and advice I know what to improve by the next show. What category did you enter and what was your piece? What Saracino products did you use? I’ve entered three categories: small decorative exhibit, decorated cupcakes and miniature exhibit. I’ve used Saracino isomalt to make the eyes, Saracino modelling paste for clothing and Saracino modelling chocolate for body and fur. I follow social media every day in search for new ideas. One of my favourite platforms is Pinterest. Some time ago I came across a sketch of a Rabbit dressed as French Noble, strait away I had this idea in my head to create either a cake or a figure inspired by this picture for a competition. It took me about 80 hours all together, just the fur itself took me 20 hours of work as each hair had to be individually moulded and placed. How did you feel on the first morning of competition? I was very stressed that day. I got stuck in traffic on my way to London and I was afraid that I will not make it there before the deadline. I was so worried that all my hard work will be wasted. Hour and a half journey ended up nearly 3 hours’ drive, but I made it just in time in the end. Tell us a little about the show, what did you enjoy most? This show was very different to any of the shows I have entered before. I must say it was amazing! I will definitely come back here again. I most enjoyed Salon Culinaire as its directly related to my passion. It was such a great feeling to be a part of this event! I have to say it was a privilege to be able to display my work, amongst the amazing work of cake decorators from all over the world! Such a great experience was worth all the hard work. Tell us about your award, how did you feel? I couldn’t believe when I first saw the results! I couldn’t feel any happier! After I collected my Gold award and Best in Class I felt proud and ever so happy, but after I was called back to the stage again at the end of the award ceremony I was speechless. Chairman of Judges Award – Sugarcraft and Best Senior Exhibit was more that I could ever dream about. What advice would you give to anyone thinking of entering? Remember to keep your work clean and take time to finish the piece. Attention to detail is the key to the success. If you are not sure about something ask member of your family, I always ask my husband for his opinion. It’s very important to ask someone who will be honest with you and will tell you what they really think but remember – it’s your vision so you need to make the final call. Have you won any other awards? 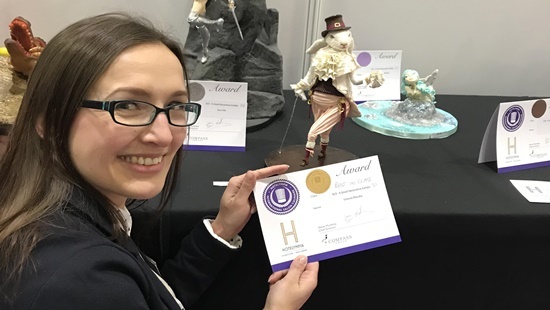 I took part in my first competition in 2014, at Cake International in London. I was awarded silver medal in the Wedding Cake category. 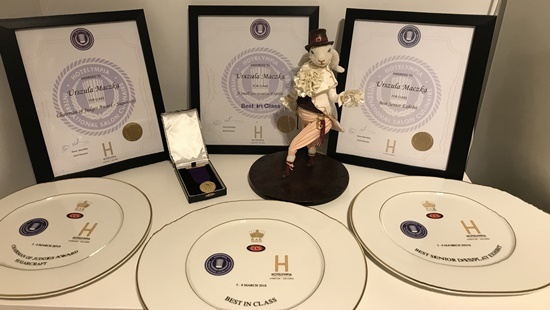 In 2016 I’ve won two awards, Silver award in Decorative Exhibit and Gold award and third place in Cup Cake category with my edible coffee and tea cups and saucers. Later that year I tried my luck at first ever Cake Festival in Poland. My 3D “Mother Nature” cake, received gold award and third place in that category. My hand painted “Alice in Wonderland” theme cookies, received gold award and I also won gold in Small Figure category. I will definitely take part in this competition again. Every single time I push myself and learn different techniques. What cake tool can’t you live without? Who inspires you – who’s your favourite cake / sugarcraft artist? What’s your favourite Saracino product and why? Pasta Model and modelling chocolate. What’s your best advice in 5 words or less? Learn, make, don’t give up. Take a time and visit Urszula’s page to see more of her beautiful creations.